Unable to Attend Sunday Services? In the deep winter, we invite you to consider attending some of our learning events. Our calendar lists our webinars here: http://www.midamericauua.org/events/webinars. Why would you take the time to read about another UU congregation, or to visit one when you're traveling? No congregation can copycat another, and we wouldn't suggest that. But learning about another congregation can provide ideas that might spark something in your own congregation. Many factors have contributed to the growth of this congregation: a willingness to try new things, professional leadership by a skilled minister, investing in lay leadership by consistently sending people to MidWest Leadership School, patience to let ideas mature, careful planning, generosity of spirit and of resources, and more. The Lawrence congregation is celebrating this Breakthrough designation in several ways. This year's pledge drive is taking the "Breakthrough" designation as its theme, with this slogan: "Breaking through to a Stronger Future" and a runner as its logo. A study guide for the UUWorld article is available at http://growinguu.blogs.uua.org/numerical-indicators/uncategorized/study-guide-for-uuworld-article-the-unitarian-fellowship-of-lawrence-kansas/ Congratulations to the Unitarian Fellowship of Lawrence! Way to Grow/Go! 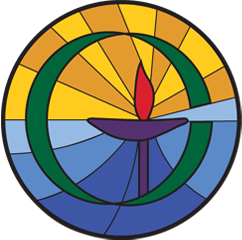 In 2011 Open Circle Unitarian Universalist Fellowship (OCUUF) in Fond du Lac, Wisconsin applied for and was accepted for Candidacy in the UUA's Green Sanctuary program. One of the possible Sustainable Living projects was entitled "Renewable Energy - Solar PV Electrical Generation Feasibility Study." We undertook this study and found that it was feasible to install solar panels. In December 2012 we were awarded Green Sanctuary certification. As part of the investigation into the possibility of installing solar panels, we looked into various ways of funding the project. We discovered that currently in Wisconsin, the legality of 3rd party funding for solar PV projects is unclear. Several members began attending Renew Wisconsin meetings, and we did make contact with a renewable energy consultant to look at options. The possibility of establishing a cooperative was discussed. Information on Focus on Energy grant money was obtained. Then after many months of discussion and brainstorming, the fellowship voted at the annual meeting to go ahead with the project either by establishing a cooperative or by fund raising. Finally, it was decided to begin fund raising. If enough money could be raised to fund half of the project, the Board would approve using matching funds from the church Vision fund. In less than 2 months, the money was raised! On October 10, 2014 the solar panels were up and running. On October 22nd we had an open house to celebrate. At the end of October we were awarded a $2,400 grant from Focus on Energy. The consultation and installation cost of 18 solar panels was $24,168. The members donated $13,783 specifically for the solar project. After deducting the grant, the cost to the church was $8,085. Are You Unable to Attend Sunday Services? Perhaps the weather is terrible on a Sunday morning, and it would be dangerous to drive on the icy roads. Or perhaps your spouse or partner or child isn't well enough to attend the service, and your attention is needed at home. If you are unable to get to your own congregation's Sunday services, you could "attend" the Sunday service of a congregation whose services are being live-streamed over the internet. You could tune into the church services of the UU Church of Bloomington, Indiana, at 9:15 or 11:15 a.m. [Eastern]. Find information here: http://www.uubloomington.org/ Previous services are archived on the site. We're going to start listing congregations doing live-streaming on our MidAmerica web site www.midamericauua.org. If your congregation is live-streaming services and you'd like to be listed, let me know. Contact Nancy Heege at nheege@uua.org. Unitarian Universalists for a Just Economic Community (UUJEC) invites you to join them at a conference "Escalating Inequality or Opportunity for All?" to be held at the Unitarian Church of Evanston, Illinois, February 20-22, 2015. UUJEC hopes to have participants representing the diversity of Unitarian Universalism who want to implement the Congregational Study Action Initiative, "Escalating Inequality," passed at the 2014 General Assembly. They invite congregations to send folk who will return equipped to provide the leadership for study groups and action projects in your community. Scholarships are available, with a generous grant from the UU Funding Panel for Social Responsibility, to help defray costs as needed. Contributions toward scholarships will be matched up to $2000 by the Funding Panel to add to the above grant. They want those affected by the effects of escalating inequality to attend and share their stories. Our colleagues are trying experiments in ministry: new urban starts, multi-site congregations, and varieties of worship forms and places. As we continuously reinvent the form for the changing age, what are these pioneers learning? We'll hear from the founding minister of an urban start, a founder of an innovative worship and community model, and two trailblazing multi-site pioneers. The planning committee - five ministers from each chapter in Central Midwest, Heartland, and Prairie Star - hopes that the program will leave you encouraged and hopeful about our faith, and ready to take smart risks for our time and places. Special rate at the Marriott; call 1-800-514-4684 and use code UUA. Room rate is $89 and includes internet. Followed by the first-ever one-site MidAmerica Regional Assembly, at the Marriott. The Midwestern Women and Religion Committee announces their Winter WomanSpirit Conference 2015, "Healing Words: a Call to Consciousness," February 6 - 8, in Hartland, Wisconsin. Unitarian Universalist writer and feminist Mary Pierce Brosmer will lead the program. The Women and Religion Committee, and all Committee sponsored events, are open and welcoming to all those who identify as female.